It was the closest any other brand has come to replicating Apple. The crowd went wild in response, whooping and cheering and pretty much losing sense of perspective, when Samsung’s David Park raised his wrist to reveal the Galaxy Gear in the wild for the first time. Despite its many limitations, such as launching only as a companion device for the Note 3, Samsung deserves recognition for the getting the party started on this new gadget frontier. Several brands have floundered with instantly forgettable smart watches, and with Apple not stepping in to lend this category some glitzy credibility, the job fell to Samsung, who handled it manfully. 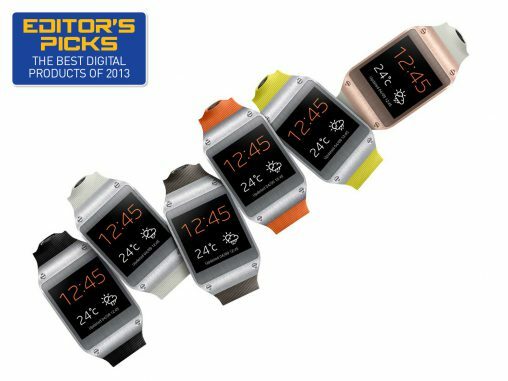 The jury is still out on whether ‘wearable’, and smartwatches in particular, are here to stay or a passing fad, but there is no doubt that Samsung stole the mindshare off rivals Pebble and Sony with its glitzy Gear launch in Berlin in September. Best Feature: 1.9-megapixel camera for instant happy-snapping. [These are] some of the most innovative products we’ve ever launched. These products represent a combination of cutting-edge R&D, world leading innovation and pioneering design that will offer Australians a completely unique experience for our mobile devices. Our goal with the Galaxy Gear is to be embraced by a wide range of consumers, from tech-savvy fans to fashionistas, business people, athletes, music fans, young and old.